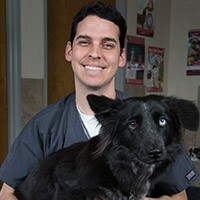 Alex "Spike" has worked at Foothills Animal Hospital since August 2002, and has been the Front Office Manager since 2006. She is married and they have several furry children, Phoebe, Ben and Gertrude. 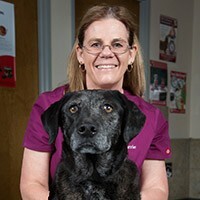 Caroline has been working as a certified veterinary technician for the Foothills Animal Hospital since 1989. Animal care has always been the most important part of her life, having passions in dentistry and surgery. She enjoys working at Foothills with other people who also share her passion for animals. Her kids are of the furry kind and currently include Lita, a Shih Tzu; Jerome, a Peekapoo; and her newest addition Angus, a poodle. Amanda moved to Arizona from Wisconsin in 2000. 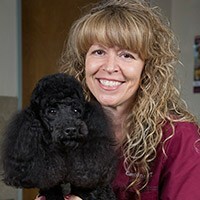 She started working at Foothills Animal Hospital in January 2001 and became a certified veterinary technician in 2003. She has two dogs, Kingston and Gretta, a cat, Riley, and a Cockatiel, Oz. Amanda enjoys running, playing soccer, and playing with her dogs. 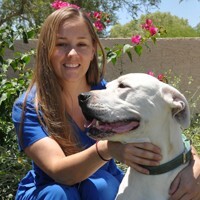 Amanda likes to think of Foothills Animal Hospital as her Arizona family! 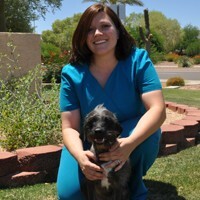 Geneva has been a certified veterinary technician since 2002 and has been working at Foothills Animal Hospital since 2008. Geneva and her husband have two cats, Nami and Chaplin, and a dog, Blues. They also have a son named Jack. 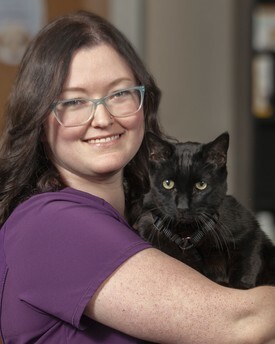 Krista has been a veterinary technician at Foothills Animal Hospital since 2005. She has a black lab named Cayda, a one-eyed cat named Tiki, two Box turtles and a Leopard Gecko. 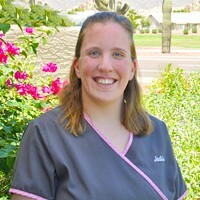 Krista is an Arizona native and loves to take Cayda to the lake to paddle board. Alicia, another Arizona native, joined our team in October, 2015 and became a certified veterinary technician in December, 2015. 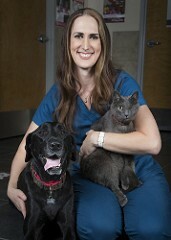 Alicia has a love for the field of veterinary medicine, making her a great addition to the Foothills Animal Hospital. She shares her home with 2 cats, Toothless and TJ. Jodie has been a veterinary technician since 2002. 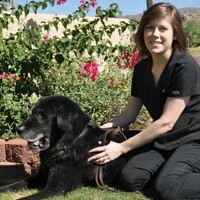 She moved from New Jersey in 2004 and has been working for Foothills Animal Hospital since she started living in Arizona. Jodie now works in the front of the hospital as a receptionist. 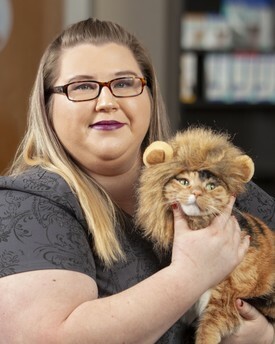 Carrie is a receptionist for the Foothills Animal Hospital and began in December of 2014. Like the rest of our staff, Carrie has a love of animals and has worked in the animal care field for the past 16 years. Carrie is an Arizona native, born right here in Phoenix. She and her husband have 4 grown children and 2 grandchildren. They currently share their home with a dog named Dooley and a cat named Mia. Chris has worked at Foothills Animal Hospital as a receptionist since July 2015. Originally he is from San Diego, California and moved to Arizona in 2003. Chris enjoys the customer relations aspect and family feeling of working at Foothills Animal Hospital. He is married and they have several furry children, Phoebe, Ben and Gertrude. Victoria is from Chicago, IL. She has always had a love of animals and dreamed of working with and helping them. In 2016 she graduated from Vet Tech Institute at Fox College in Tinley Park, IL. After months of debating she decided to move to Gilbert, AZ and start her career. She has been working at Foothills since 2017 and is looking forward to many more! She has 2 dogs (Lucky and Shiva) and 1 cat (Pineapple). She likes to have fun hanging with fellow employees, going to the movies and singing karaoke.